Just like we mourn the passing of summer, so we will mourn the moving of our bartender Mark... to the Twin Cities. Tuesday Funk #85 was his last show with us, so in honor of his tenure, we drank extra hard. We also had some stellar readers! Brian Heath started us off with a heartbreaking story about the passing of his father, and then David Daskal shared a dark excerpt from his novel about a teenaged girl who cuts herself. In a change of tone, Amanda Claire Buckley gave us a warm and humorous retelling of the Virgin Mary's story, set in present-day New York. We drowned our sorrows in our final beers from Mark. After intermission, cohost Andrew Huff enlightened us on current events in haiku form, and then Paul Dailing told a story about the annoyances and benefits of being colorblind. 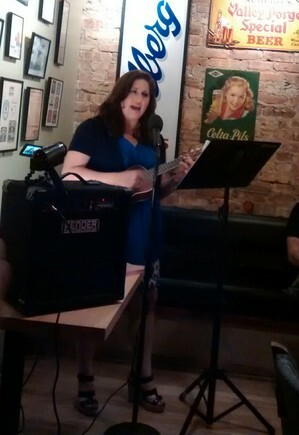 Finally, Jill Howe treated us to BOTH entries from her high school diary and a song about The Crucible, sung to the tune of Alanis Morrissette's "Ironic" and played on a ukulele. Oh what a night. Won't you join us next month? Tuesday Funk #86 on October 6 will feature Jen Masengarb, Coya Paz, Lori Rader-Day, Carly Oishi, and Tom Haley! Reminder: Tuesday Funk #85 is tonight! Catch the tail-end of this summer's funk at Tuesday Funk #85 - Tonight! Featuring Brian Heath, Amanda Buckley, Jill Howe, Paul Dailing and David Daskal! Plus your humble co-hosts Andrew Huff and Eden Robins. Please join David and all our other fantastic readers on Tuesday, September 1, 2015, upstairs at Hopleaf at 7:30 pm. This 21-and-older event is free. Amanda Claire Buckley is a self-proclaimed troubadour. 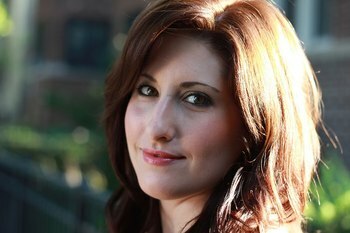 Her storytelling, music, and writing as taken her across the country--from Chicago to New York to DC--and abroad. She's performed live-lit at Essay Fiesta, Write Club, Is This a Thing, StoryClub, Story Lab, and with the kates. She's written and produced shows that have played at The Annoyance and Stage 773. She was a Next Generation Scholarship Recipient for the National Storytelling Network and her show The Out of Tooners was named a "Favorite Show of the Fringe" at the Capital Fringe Festival in Washington, DC. She also forgot to buy cat litter last weekend. 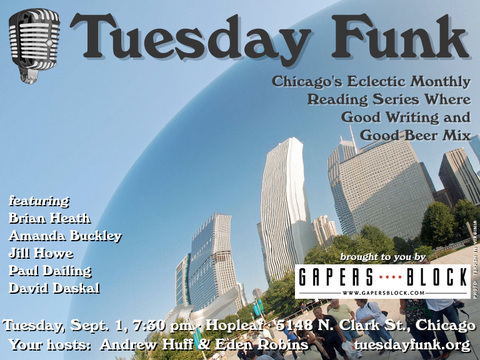 Please join Amanda and all our amazing readers on Tuesday, September 1, 2015, upstairs at Hopleaf at 7:30 pm. This 21-and-older event is free. Paul Dailing is the creator of 1,001 Chicago Afternoons, a website telling new, true stories of Chicago and real Chicagoans three times a week until he hits 1,001 stories. 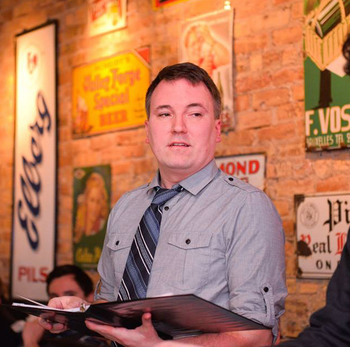 The project won a Peter Lisagor Award for Exemplary Journalism from the Chicago Headline Club in 2013 and will be featured in the upcoming "Chicago Authored" exhibition at the Chicago History Museum. He co-hosts the Welcome to the Neighborhood illustrated reading series, last seen at the Museum of Contemporary Art Chicago. He teaches journalism part-time at Loyola, once found a triceratops femur and is working on a history of the South Chicago steel mills. Buy him a torta. Please join Paul and all our amazing readers on Tuesday, September 1, 2015, upstairs at Hopleaf at 7:30 pm. This 21-and-older event is free. 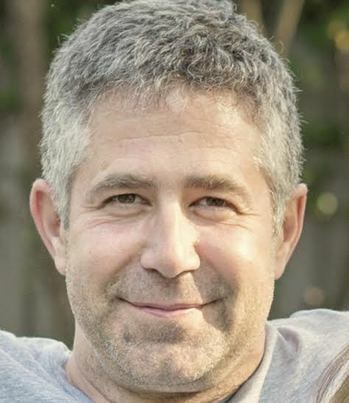 Brian Heath is a veteran of film and television production turned writer, comedian and storyteller. 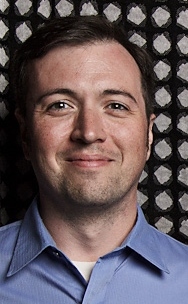 He has performed sketch and improv at Second City, IO Chicago and The Annoyance Theater. He is currently a writer and performer for local sketch comedy troupe Cassandra. Cassandra has been featured at Chicago's Sketchfest as well as the Printer's Row Lit fest. The group also has a monthly residency at Hopleaf where they perform live-radio style sketch and music every last Tuesday of the month. 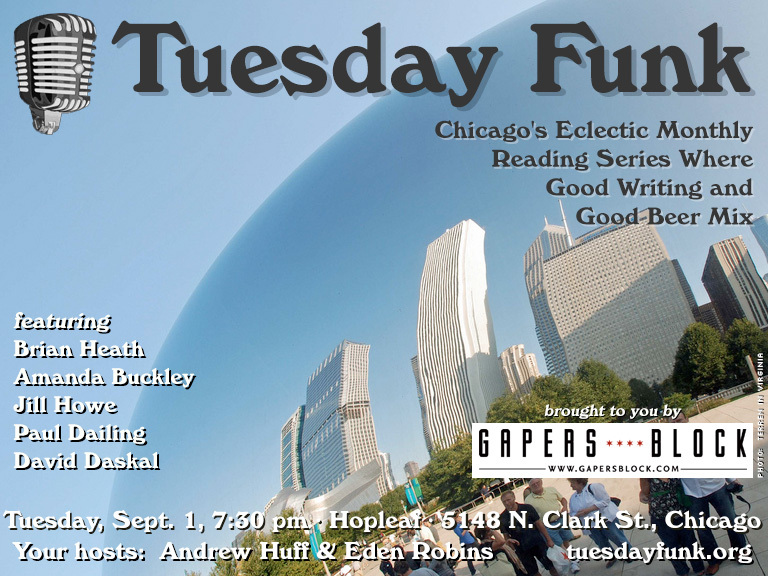 Please join Brian and all our multi-talented readers on Tuesday, September 1, 2015, upstairs at Hopleaf at 7:30 pm. This 21-and-older event is free. 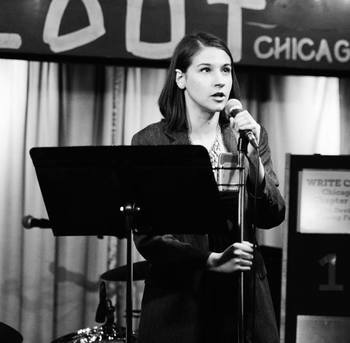 Jill Howe co-produces Story Sessions, a monthly live lit event featuring true stories connected through a theme, live music and real-time story-inspired artwork at the beautiful City Winery in the West Loop. In addition to performing her own stories, Jill also coaches storytellers and organizes writing groups throughout the city. Please join Jill and all our wonderful readers on Tuesday, September 1, 2015, upstairs at Hopleaf at 7:30 pm. This 21-and-older event is free. In an unexpected turn of events, Tuesday Funk landed in the pages of Travel + Leisure magazine's August issue! If you were at our March show, you may recall a photographer in attendance, taking pictures of the readers and audience. 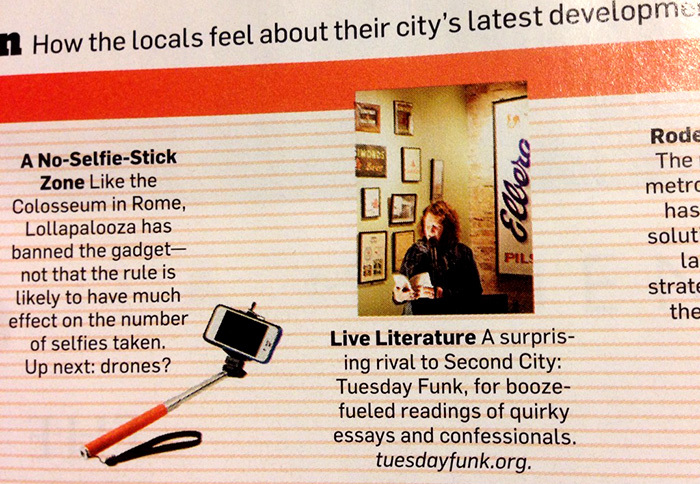 That was in support of what we thought would be a piece on Chicago's live lit scene, but ended up just Tuesday Funk being included on a "wired/tired" style list of things Chicagoans are into and not so into -- with the show landing on the plus side, just between the selfie stick ban at Lollapalooza and birth control for rats. Hey, weird publicity is better than no publicity, right? While we wouldn't consider ourselves in even the same category as Second City, hopefully Tuesday Funk's eclectic mix of literary genres is entertaining nonetheless. Please join us at our next show on Sept. 1 at 7:30 pm in the upstairs lounge at Hopleaf, 5148 N. Clark St. Our guests will be Brian Heath, Amanda Buckley, Jill Howe, Paul Dailing and David Daskal, Andrew Huff and Eden Robins will be the co-hosts, and our lovely bartender Mark will be ready with beer, wine and whiskey to soothe your soul. RSVP on Facebook, and we'll see you there! Wow, back-to-school time already? Tuesday Funk will help you forget about test anxiety with readings by guests Brian Heath, Amanda Buckley, Jill Howe, Paul Dailing and David Daskal to your favorite eclectic monthly reading series. Join us Tuesday, Sept. 1 in the upstairs lounge at Hopleaf, 5148 N. Clark St.
Don't forget to RSVP on Facebook and, as always, bring a friend. And hey, become a fan so you never miss an invitation to one of our readings. We'll see you in September!